KIDS Georgia won Most Creative Presentation during the poster session. 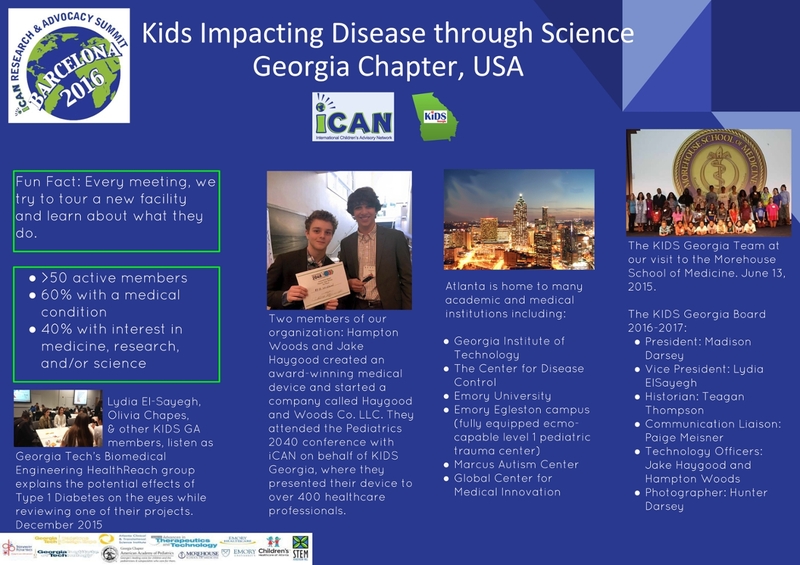 KIDS Georgia is a local chapter of the International Children’s Advisory Network, a consortium designed to improve the research process by giving children, both well and sick, and their families a platform to give constructive input on improving the research and medical innovation process. The group utilizes online-based surveys, focus groups, forums, and more to engage all of the youth advisory networks. The diverse socioeconomic and cultural backgrounds, as well as varied health statuses, pose an ideal, diverse network through which researchers can conduct studies and receive feedback. Bringing the perspective of a younger population creates meaningful outcomes for research as a whole. Each year, chapters from around the globe come together for the iCAN Research & Advocacy Summit. This provides groups the opportunity to learn more about each other while engaging with professionals and the scientific community on a larger scale, acting as advocates for the world’s children. This also gives healthcare professionals and researchers the opportunity to tap into an incredible network of passionate people determined to make a difference in pediatric medicine. Amongst those in attendance at the 2016 summit in Barcelona, Spain were speakers and representatives from leading organizations like the U.S. Food and Drug Administration (FDA), Health Canada, Pfizer, Nuffield Council on Bioethics, European Patients’ Academy on Therapeutic Innovation, The Royal College of Pediatrics and Child Health, and various Children’s Hospitals internationally. The summit hosted other educational and cultural activities as well, including a visit to Fundacio Alicia, a research center focused on healthy lifestyles. A poster session is also included each year, allowing children the chance to present projects their individual chapter has been involved with over the past year. KIDS Georgia won Most Creative Presentation during the poster session for their poster, “Kids Impacting Disease through Science, Georgia Chapter, USA.” Their representatives Hampton Woods, Heidi Woods, Lydia El-Sayegh, Madison Darsey, Hunter Darsey, Chase Kelly, Kuna Foon, and Sainbou Foon possess maturity beyond their years and a finesse for public speaking, exercised in other successful conferences like pitching inventions at Pediatrics 2040 or in conversations with elementary school children about STEM. “The team holds immense amount of promise in the coming years, and is looking forward to another exciting meetup in the summer – this time, on U.S. soil in Orlando, Florida,” said Stephanie Meisner, RN, CCRP, director, KIDS Georgia.